There was no separating these teams when they met earlier in the year, and for most of this final it looked like it was heading towards another draw. But three goals in the second half lifted Worcester to victory, and their captain Liam Kelly lifted the cup on a 3-06 to 0-08 scoreline. Worcester Captain Liam Kelly raises the junior C hurling cup. The Barley House Wolves, from Concord NH, opened the scoring in the day’s first match through a Sean Naughton free. The Wolves were the more physical side in the first half and Michael Gregoire stretched to the max on more than one occasion for a diving block. Naughton would add two more frees before the halftime whistle and Barley House led 0-05 to 0-02 at the break. It could have been more if not for a brilliant Mike Default save that denied Barley House’s John Mullen at close range. Worcester’s points came from a C. Kenny free and a fine effort from Liam Kelly on the run. Worcester’s Seamus O’Shaughnessy scored the first point of the second half and it was the score of the day. The center forward plucked a sideline cut out of the air and fired a curling point over his left shoulder to get his side moving. Pat Naughton answered with a point for Barley House to keep them in the lead, but the match flipped on its head shortly after. Worcester’s corner forward was dragged down inside the box, and C. Kenny stepped up to the spot and blasted home to draw his side level at 0-06 to 1-03. Minutes later Worcester added another as Liam Kelly caught a long ball in and finished to the back of the net with his marker hanging off him. Pat Naughton answered with a point for Barley, and both sides ramped up the ante in the game’s closing minutes. A thunderbolt of a shoulder from one of the Western MA men left a Wolf lying in the grass, and Worcester put the finishing touches on their championship with another goal from captain Liam Kelly. Offaly started this match very brightly and for most of the first half it looked like Tipperary might have been California dreamin’ too early. But going a man down early seemed to spark the Premier county men and they’re off to San Francisco with cup in hand after raising their game near the heights shown all year. Stephen Brown struck the sliotar cleanly, and Offaly struck first with a stylish early score. They jumped out to a 0-03 to 0-01 lead on the back of points from Stephen Hallissy and another free from Brown. Tipp’s Patrick Moriarty, one of several men on both sides playing their second match of the day, sent over a fine score from near the sideline. Tipp’s Paul Morris picked up his second yellow card before halftime for a love tap on an Offaly knee. Stephen Brown didn’t let the resulting free go to waste, but Tipp came to life after Morris was shown red. They moved into the lead on the back of points from Russell Quirke, Sean Stafford, and Kieran Lowry, and Tipp led 0-14 to 0-08 at halftime. Offaly’s Cathal Cusack was handed a red card shortly after the restart. Brown made the most of Offaly’s man advantage with two more frees, but the advantage disappeared after Alan Bergin was sent off. Both sides finished with eleven players. Tipp increased their lead with a Cronan Dempsey point, the center back putting his name on the score sheet after steeling his side all day. Stephen Brown kept Offaly in touching distance with a beautiful free, and Chris McMahon buried a goal to cut Tipp’s lead to just two points. Tipp needed a score and got two from their center forward, Jimmy Maher, who powered the ball over the line to send the green flag waving. Tipp were made to sweat in the final minutes, but raised the cup with a 1-20 to 1-15 victory. Sunday August 20 - Irish Cultural Center, Canton Mass. McAnespies have made it this far against the odds - can they take the final step? So, we are down to the last two teams standing after a very close run senior football championship. Starting with the Shannon Blues. The Blues have at times looked unstoppable this year, and at other times disjointed and perhaps a little uninterested. Most of these players have played together over the last several years in Boston, and know each other’s style and tendencies. The Blues can play physical and can play fast. All positions on the field are more than adequately covered with the starting 13. With the diamond of Barry Hartnett, Wayne Guthrie, Brian O’Seanachain, and Darren Wallace, the Blues are sure to win plenty of possession around the middle of the field. Kieran Hurley and Josh Ryan can convert in the full forward line, while Greg Horan and Lee O’Donoghue can take the scores from farther out the field. Brian “Biscuits” Kennedy has taken the Blues to the promised land before and the team is on a 4 game winning streak. The Blues beat McAnespies earlier this year, however, this will be a different game. McAnespies made it to the playoffs as the sixth team in the door, and have made the final the hard way. An extra time game against the Connemara Gaels, and a physical battle with Donegal have been character forming and in these games, the team has shown considerable mental resolve. One thing McAnespies can do, and do it very well, is defend. A strategy of getting behind the ball and forcing turnovers or poor percentage shots has worked the last 3 games. Players such as Robbie Croft have been in an unfamiliar role deep inside their own defence, but have adapted well to winning possession and keeping it. What McAnespies will be missing is Brian Breslin, who will be suspended for the final following last Sunday’s red card. However, Marty Mongan has proven to be a goal threat on the edge of the square, and with points engineered by the running of Ferghal McGeough, Michael Walsh, and Niall Rooney, and the leadership of Danny McBride, McAnespies have found a way to make it work. The Blues will be the favourites in this one, however, we have learned not to write McAnespies off. If it still close coming into the final 15 minutes be prepared for anything. Shannon Blues Juniors take the field for a final for the first time since 1999. Cork have made the junior A football for the first time since 2014. The rebels scraped through against the Connemara Gaels in the semi-final last week, but for the reprieve of an injury time penalty, Cork could have been on the outside looking in. Cork showed resolve in reining in a wide Gaels lead, and the experience of that should stand to them in the final. Cork’s talisman is their all-rounder, Cathail Arnold. Arnold is the go to guy when the chips are down. The Mourne man makes a difference whether playing in the middle of the field or in a more forward position, and close to goal the alarm bells ring when he has the ball in hand. Paudi O’Shea is another dangerman. O’Shea usually plays at corner forward and knows the way to goal, whether from play or frees. In the middle of the field Jack Lynch has developed into a strong player. Lynch has been an underage talent to keep an eye on over the years, and now is starting to deliver on that potential. At the back club stalwarts Seamus Loftus, Colm Caffrey, and Darren O’Donovan will be tasked with holding the fort in the face of a determined Blues challenge, and will be looking to keep the goals out as this has been their Achilles heel recently. The Blues have not been here in almost 20 years and now is a chance for dedicated clubmen and local youth products such as Pat Murray, Conor Fitzgerald, and Maurice Young to take the field in the biggest game of the season. The Blues have a team that can play some nice football. Mike Moriarty is steady in goal, and the experience of Shane Kelly, Derek O’Brien, Pat Moriarty, Conor Mullen and Mike Ralston will stand to the Blues in the heat of a final. Combined with the talented Shane Connaughton (nephew of Bernie), and up front, Jack Goulding, the Blues make a strong case to claim the Pat Callaghan Cup. Last week’s semi-final saw the Blues dethrone a good Donegal team with room to spare. This game could go down to the wire. Tipperary won the Sheehan Cup in June - can they add the junior championship on Sunday? Offaly beat Tom’s out to make it to the final to face Tipperary next Sunday. The semi-final went to extra time, and with an extra man Offaly eased through in the additional period. Jimmy Rigney is the first player that comes to mind when thinking of Offaly. Rigney has the experience and know how, as well as a deft touch that can make all the difference. Offaly’s half back Iine did well in the semi-final with Rian Dempsey, Jack Murray, and Adrian Cleary the starting point for Offaly attacks. Along with a solid goalkeeper in Gary Sherlock and Stephen Brown at the other end capable of putting up more than a few scores, Offaly will be hoping to give Tipperary a rattle. For their part the Premier County boys have been just that all season – the Premier Team. Tipp have won every game by double digits. Offaly managed to keep them to 10 points earlier in the year, and that is as close as anyone has got. Whether Tipp will be held remains to be seen. Tipp have a handful of seasoned campaigners at the senior level in Sean Delaney, Sean McGarr, and Cronan Dempsey. Their major strength is at the corner forward positions with Russell Quirke and Sean Stafford liable to rack up the scores and put the game out of sight within a short period. Along with Pat Moriarty, Kieran Lowrey and captain, Jimmy Maher, at center forward, Tipperary will be confident that Sunday will deliver the junior A championship. Few would predict that it will turn out otherwise, but, stranger things have happened. Barley House Wolves and Worcester will meet for the 2017 Junior C Hurling title at stake. 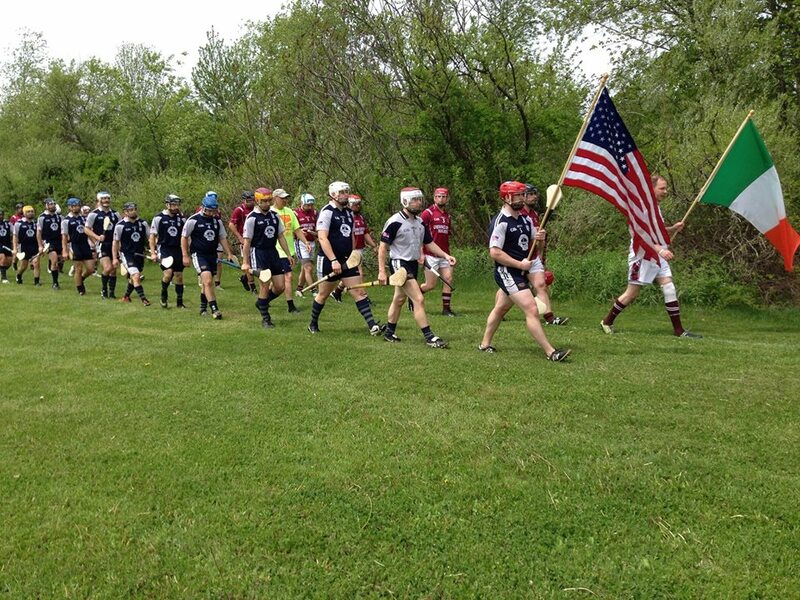 The junior C hurlers from Worcester and Concord NH will be on the main field Sunday to battle for the Northeast championship. The Barley House Wolves from Concord finished top of the table, and Worcester close behind with 2 less points. Their encounter during the season finished in a tie, so all signs point to a close game between these two teams. Each side contains plenty of talent, and at this stage, plenty of stalwarts for their club’s cause. Expect some fireworks from this one, the Sean Naughton, Dan Hannah, Alec Foley, Michael Gregoire and Co will be eager to defend the title they won last season and make it two in a row for the BHW. Worcester, will be just as committed to taking it away down the Mass Pike. It was a game that contained the best of the game – and the worst. There were ugly scenes in the first half as two major melees broke out. The result of both was a plethora of yellow cards, and one sending off. The best of it was the heart and determination shown by McAnespies, when a man down, and after losing their key midfield men, how they buckled down and against the odds, and made it to the 2017 final. The re-entry to the game of a taped up Danny McBride to see them over the line added a dramatic twist that the tale deserved. It was an incident packed first half in which there were numerous yellow cards were issued and one sending off. It was shaping up to be a good game of football before two melees broke out. One in the McAnespies goalmouth and shortly afterwards, in the Donegal half of the field. Referee Pa O’Driscoll was the center of attention as he took several minutes to try and sort out who was responsible for what, such was the degree of kicking, punching, and shoving from most of the players on the field. In fairness to O’Driscoll, he would have been justified in calling the game, but decided to issue a red card to Brian Breslin as he was adjudged to have been the starting point of the row. Others got away lightly with yellow cards, which at least players were on notice. Had reds been issued it could have been a 7 or 8 a side game, which was not what people turned up to see. We carried on in the hope that a game of football would break out. At the end of it, the crowd was treated to drama seldom seen in Canton, even among the numerous dramatic games over the years. On the football front McAnespies had netted through Marty Mongan who fisted a high ball over the line from the edge of the box, and playing the ball well from the back, McAnespies converted three points. Just before the fighting, Danny McBride had to leave play due to a wrist injury and, after the red for Breslin McAnespies lost their second midfielder. Few gave them a chance with a man down and their two most important players of the season on the sideline. Donegal had pointed through Ted Furman and a beautiful curler from Enda Varley. But McAnespies kept it tight in their own half of the field, and Donegal did not have not whole lot of room in which to operate. At the break it was McAnespies by a point, 1-3 to 0-5, and the buzz in the stands was all about the scenes that ended the half. The second half saw McAnespies hold their own, and over the first 10 minutes outscored their opponents. Niall Rooney, Robbie Croft (2 frees) and Ferghal McGeough capitalized on opportunities from breaking out of defence. One felt that with the man advantage and the pedigree of players in the forward line, it would just be a matter of time before Donegal caught up. Fatigue was visibly wearing on players from both teams, but Donegal would have an edge down the stretch with that extra man. Catch up they did. Brian Donnelly, McBrearty, Kevin Toner and McBrearty again pointed as Donegal found routes through the clogged McAnespies defence. McBrearty’s second point put Donegal one to the good and surely it was now a matter of adding a few more in the final minutes and preparing for a final. It was not over however. Like Larry Bird coming back into the game for the Celtics after getting getting hurt in 1991 or Paul Pierce coming back on the floor in 2008 after leaving the game in a wheelchair, Danny McBride reentered the game with his wrist taped to the cheers of the McAnespies supporters. McAnespies rallied and McBride immediately pointed from a free to level the scores. McAnespies got the lift they needed for the last 5 minutes with the game on the line. As the defence did its job and continued to make life difficult for Donegal, McAnespies forced Donegal into turnovers and patience saw them work the ball within scoring range. Donegal were forced into fouling when Che O’Donnell or Michael Walsh were on the ball and McAnespies capitalized by pointing a free (Croft) to put them ahead. To cap it off Fergal McGeough put the insurance over from out on the wing with a wonderful score. It was an amazing end to the game and McAnespies supporters have not exhibited such a level of delight in many years. Donegal will be wondering how the game slipped away from them, while McAnespies will be taking stock and tending to their wounds over the next week when they get ready to face the Shannon Blues. Macs: Paddy Coakley, Tommy Brearton, Paul Clifford, Seamus Breslin, Eoin Delmer, Fergal McGeough, Brian Breslin, Danny McBride, Michael Walsh, Martin Mongan, Niall Rooney, Che O’Donnell, Robbie Croft. Donegal: Christy McLaughlin, Jason Noctor, Conor Burke, Sean Doherty, Jack O’Brien, Derek Maguire, Eoghan Lafferty, Brian Donnelly, Sean Donnelly, Stephen McBrearty, Mike Finnegan, Enda Varley, Ted Furman. The Gaels seemed to have the game in the bag, but Cork pulled off a second half comeback to force extra time. The rebels then had more in reserve for the additional 20 minutes and in the end came out comfortable victors. Cathail Arnold was the center of all things good for the Corkmen, and when the Down man had the ball in his hands it was almost always going to result in a score. An injury time penalty that Arnold dispatched tied it the game up. In the extra time it was Cork who secured the win and a place in next week’s final versus the Shannon Blues. Ian Heanue looks for a route past Jack Lynch. It was a ding dong first half as each side vied for control of the game. Cork defended well for the most of the 30 minutes with Colm Caffrey and Seamus Loftus doing well in the half back line. At the other end of the field, Paudi O’Shea and Cathail Arnold were doing most of the damage. Arnold tallied four of Cork’s first half total, two points were well taken frees off the ground. Mark Dalton popped over a well worked point and Paudi O’Shea another, as Cork looked good in the early going. It took the Gaels a while to get into the swing of things, but once they did the goals came. Noel Graham had netted early, and the goal kept the Gaels in it as Cork outscored the westerners four points to one. With half time approaching the Gaels started to motor, with Noel Graham, Ian Heanue and Coleman Mulkerrins combining well. Twice the Gaels opened up the Cork defence and Graham netted twice, the finishes almost identical, left footed into the corner. 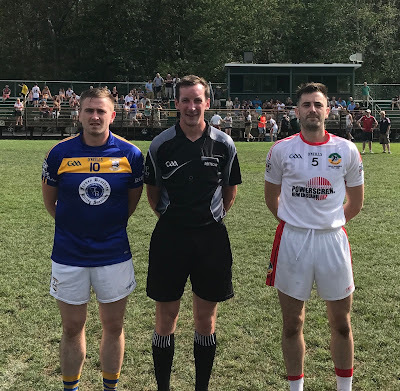 Niall Collins was involved in a point that Mulkerrins converted, Heanue put a rousing one over with a burst forward from center back, and AJ Maguire also got on the scoreboard to send the Gaels into the break up by 8, 3-5 to 0-6 – and looking good for the win. Cork picked off the points and whittled away at the Gaels lead in the second half. O’Shea, Arnold, Caffrey, and James Long were in target as the gap between the sides closed. The Gaels struggled to move the ball out of their own half, and almost like the junior B final the evening before, Cork had all routes to goal closed off and inched closer. With the lead narrowed down to a goal. Cork almost leveled the scores following a turnover as the Gaels tried to play the ball out of defence, however, the ball was scrambled off the line. Jack Lynch on the ball for Cork. The Gaels rallied to goal, this time it was AJ Maguire who was played through running on to the far post, and the youth league product bundled the ball over the line to apparently ease Gaels worries. Cork did not stop, however. Arnold, who had moved into a more advanced position, pointed three times. Playing at corner forward the ball was delivered early and often and Arnold capitalized each time. With the 30 minutes played the goal still stood between the teams, and Cork then got their chance to level it. Paidi O’Shea was bundled over just inside the box and who else but Arnold buried the spot kick. Each side had a chance to win it in the last minute, Arnold shot wide, and Gaels turned it over when in range. Extra time ensued. Cork were the side with the legs to carry them through the extra period. Cork moved the ball well to point through James Long and Dalton, and after the Gaels snatched a goal through Noel Graham with a rare attack, Cork got it right back. Arnold set it up, and O’Shea was the finisher. Cian Clifford belted another chance into the back of the net just before the turnaround and it looked good for the rebels. After Cork pointed again to open up a 2 goal lead, the red shirts defended in numbers to keep the goal safe. No repeat of last year’s final appearance for the Gaels, and for Cork it is their first appearance since 2014. Cork: Ollie Murphy, Ian Crowley, Darren O’Donovan, Seamus Loftus, Colm Caffrey, Sean Flynn, Jack Lynch, James Long, Simon Kennedy, Cathail Arnold, Leigh Cunningham, Mark Dalton, Paidi O’Shea. Subs: Sean Lordan, Cian Clifford. Gaels: James O’Donnell, Chris Lafferty, Tom Dignan, Damien Doolan, Ian Heanue, Pat McNicholas, Niall Collins, Liam McDonagh, Tommy McDonagh, Coleman Mulkerrins, AJ Maguire, Paddy McGee, PJ Conneeley. Subs: Kevin Walsh, Gavin MCrystal, Donal Reeney, Stephen Murray.